Description: 3 Themes for every month of the Year! Easy-to-use pockets are a perfect choice for integrating many curriculum areas. Lessons for art, creative writing, non-fiction writing, reading, math, social studies, science, and literature are covered through these monthly theme pockets. Each pocket includes patterns, reproducibles, and writing forms. 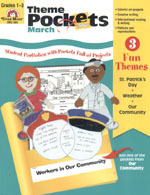 The three subjects covered in this book are: St. Patrick's Day, Weather, Our Community. Each book is 96 pages, paperbound. This new book is from a book store and may have our price sticker on the back. We ship next business day after you order and send you shipping/tracking number!